I am involved in, or have been involved in, a wide variety of "vintage dance" styles: Victorian, Renaissance, Baroque, Ragtime, Jazz Age, Swing and Regency. Most of these have found some comfortable compromise between historical accuracy and modern tastes, with a general foundation of historical understanding underlying those compromises. That's not really the case with "Regency Dance". 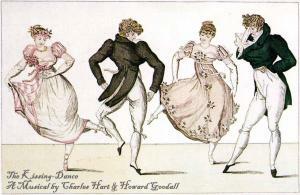 Modern "Regency Dance", with it's total lack of dance steps other than the "March"(walk), "Slide" and "Set" is, essentially, the rediscovered English Country Dance folk tradition, as revived in the early 20th Century by Cecil Sharpe, and lacks those things, other than figures, that made the dance of the Regency what it was. While I very much enjoy English Country Dance on its own merits, I think, when we are calling it "Regency Dance" it would be good to make some effort to create something that is at least somewhat historically informed - and the vast majority of the Regency Dance community is unaware that what they are doing isn't how it was done, or have heard that the steps were "complicated and balletic" and therefore unattainable for all but the most skillful and fanatic dancers. The truth is that the steps are not difficult, and introducing them, even if performed imperfectly, alters the whole spirit of the dance and evokes much more of the original spirit of the time of Jane Austen and Beau Brummel than you do by simply walking through the figures. Further, we are all free to cherry-pick the past, and take from it what we will. If someone becomes familiar with the steps and then chooses not to do them, then he or she is choosing from a place of knowledge rather than ignorance. That is what I will be trying to assist on this website, where I will make available copies of some key dance manuals from the period, and also provide what I hope will be helpful analysis, opinion and instruction. I have no illusions about historical footwork being universally adopted in the Regency Dance community - but I do hope that it may be widely enough practiced (and those who walk and those who dance can coexist in the same set) that the grace and the lively, exuberant spirit of the Regency Country Dance can find its way into what we do today.